is a PhD student in American History at the University of Rochester whose writing has appeared in Dissent magazine and The Nation. He served five years in the United States Marine Corps. 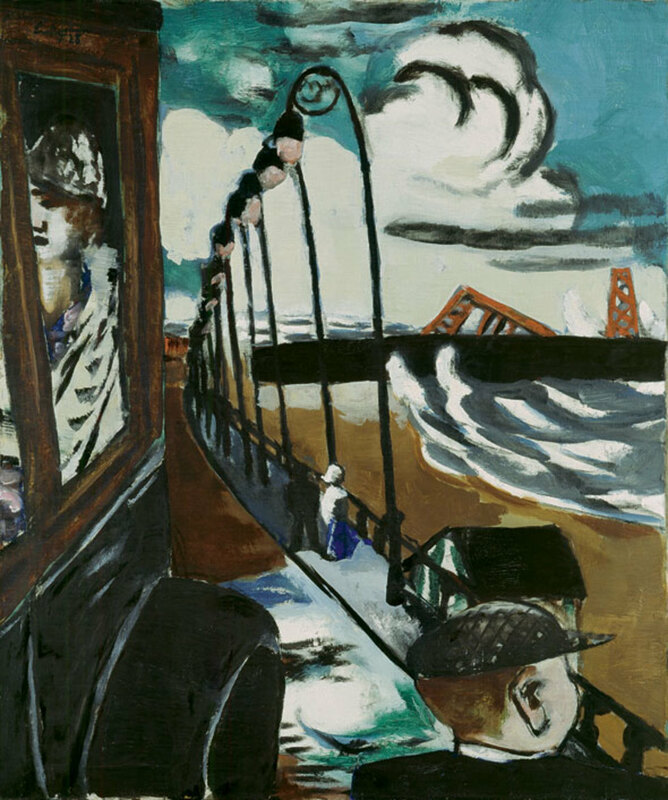 If you’re fortunate enough to visit the Kunsthaus Zürich in Switzerland, odds are you’ll saunter by Max Beckmann’s Strandpromenade Scheveningen with little more than a passing glance. I don’t blame you. The permanent collection is massive and stocked with works of far greater seductive power. But the scene of a young man making his way along a menacing waterfront, with all the elements (human and otherwise) arrayed against him — this struck a chord with me. I learnt later that Beckmann served as a field medic during the First World War, and I figure that’s the key. What many might view as a mundane depiction of a gusty day at the beach, I interpreted as a harrowing expression of the alienated veteran. I even mistook the street lanterns for decapitated heads, morbidly draped. Ever since I stumbled on the Beckmann painting in early June, I’ve been brooding over it. This is curious, as at the time I happened to be hopscotching across Europe in a dynamic fashion, trying to escape the half-decade of military life behind me and the untold years of academic tedium ahead. I spent three weeks on an organic farm in central France, scraping dung from a donkey’s stable and instructing the owner and her two daughters on how to block a jab in martial arts or prepare a mean burger. I walked 250km of the Saint Jacques de Compostelle trail with an oversized pack verging on 30kg (‘piss-poor planning,’ as we say in the ranks). I slipped into an advanced viewing of On the Road at the Cannes film festival, thanks to the maneuverings of a dear and well-connected friend. I couch-surfed with a gay man in Paris, where he and his pals accompanied this straight guy to All Fours, the most flaming restaurant in town. My final night in Barcelona, after surviving a sweltering and self-imposed itinerary of all things Gaudí, I befriended an Italian girl, a graphic artist born and raised in Rome, who took me on a tour of her favourite late-night haunts. And given it was the season of Euro 2012, I passed and smashed beers with dozens of jovial unknowns at bars and bistros from Berlin to Amsterdam to Brussels, celebrating the world’s most beloved sport. One might imagine that these are the memories that linger. And yet, one would be wrong. It’s the ominous Strandpromenade that holds me. Unlike Beckmann, not to mention some of the Marines with whom I have served, I didn’t experience any war-related trauma during my (almost) year-long tour in Afghanistan. I played occasional spectator to vehicle explosions up close, or bodily horrors from afar, but I never endured the bleedings-out of enemies and comrades. Nor did I submit to a daily routine of foot patrols or other missions that could reasonably fall under the rubric of imminent danger. I functioned as an intelligence officer, not a grunt. I might have flown out of dodge with a combat action ribbon, but my deployment, in toto, was conclusively antiseptic. So why the hang-up? All veterans, no matter their history, register some level of estrangement at the sight of their homecoming. Modern war is too grave, and modern peace too frivolous, for this to be otherwise. The return to celebrity gossip and ‘reality’ television can be grating. It has a tendency to awake and beckon. Military service can induce a stubborn and sombre awareness of other people’s suffering. This is a way of being in the world that might grip any individual, community, or vocation, but perhaps is most violently embodied in Beckmann’s sad strolling veteran. This doesn’t mean our soldiers are saints — far from it. And it must be noted that most of this awareness, most of the time, is reserved for buddies or notional buddies, always out there at the front. Regrettably, it’s a surprise to come across a fellow vet whose sympathies are extended beyond his band of brothers and sisters, much less to the everyday toils of Afghans or Iraqis, or in its broadest form, all those struggling under oppressive systems and forces, at home and abroad. But it’s a severity of awareness all the same, one that’s less developed among my civilian counterparts, even those with elite credentials, privileged upbringings and liberal educations. For the enlightened rich, their cosmopolitanism may be complete, but it’s also abstract and slight. For those on the ground doing the empire’s bidding, their empathy may be limited in range, but it’s urgent, compelling, and real. For all my righteous indignation, what I say here isn’t quite fair. There’s a wanton element to it that undermines my call for cultural seriousness. For starters, I’m assuming too much. I’m also discounting the possibility that maybe there’s something to be said for a society that has effectively marginalised upsetting feelings and thoughts. A more mature protest might not demand that everyone prove as hopelessly serious as the sad strolling vet. It would be satisfied if all shared a little in his seriousness, understanding that, as long as the majority of the world’s inhabitants continue to live and die in Hobbesian style, we all bear social responsibility; that the deepest ideals of citizenship have not been rendered obsolete in the wake of progressive taxation or the iPhone, and that in fact they’ve increased amid the growing noise. Let me leave you with something concrete. This past summer, as I happily joined in the drinking and viewing rituals of some of Europe’s loudest soccer fans, I couldn’t help but notice the half-time and post-game course of events. The television broadcast would flip to something news-related, usually involving the continent’s economic and social implosion (or possibly, the war in Afghanistan), the volume would be rolled down to the point of nothingness and everyone would tend to each other’s jokes or refills. While I understand that a bar is not the place to go in order to brave life’s difficulties, especially on game night, I still find this to be a fitting metaphor. The challenge for myself, for the readers of this magazine and for all able citizens, is to conceive and commit to a more humane balance. It is to remind our neighbours, however gently, that as long as there is blood, we are required to conduct our affairs with a measure of sobriety. How we go about this is arguable. It is my own conviction that the tactics must be multiple and reinforcing, big and small. One possibility, for example, might be an international convention led by disheartened war veterans, a kind of Winter Soldier Investigation for America’s 21st-century wars. Another suggestion would be to recruit some of these same socially conscious vets for political office, as well as any other persons who can challenge ruling orthodoxies with hard truths borne from experience. Whatever steps are taken, they must venture beyond progressives chiding in the company of progressives or radicals fuming to the cheers of radicals. We can’t afford such sectarian pride. The stakes are too high. We’ve seen too much of the fallout. And it’s our job to bear witness to the wider court, to confront injustice as best we can, together. Lyle Jeremy Rubin blogs at myrivercityblues.com.